This post comes to you courtesy of Ben Moogk, who has been a driving force in locating and uncovering lost photographs, and film footage shot by the Canadian Army Film & Photo Unit. Ben’s research has led him to uncover a film clip, and two photographs that depict Sgt. Al Grayston, and his driver, Lew Currie posing for the camera in a horse stable. Many of the drivers in the Film Unit risked their lives driving the cameramen under fire in order to get their stories. This post by Ben Moogk, is a follow up to an article shared by Vera Carver, grand-daughter of Lew Currie, April 17, 2017. LEWIS LUKE CURRIE was killed in action, July 4, 1944. (//canadianfilmandphotounit.ca/2017/04/17/private-lewis-luke-currie-was-my-grandfather/). Thank you Ben for sharing! Film has the unique magic of giving the dead a semblance of life that is not found in the still photograph. This semblance of life can now be given to one of the men who gave us our inheritance of moving images: Private Lewis Luke “Lew” Currie who was Sergeant Alan Grayston’s driver and assistant. Currie was killed in action while filming near Carpiquet Airfield with Grayston. The circumstances of his death were painful to all who knew him, are are too common in war. This short clip made at the end of one of Grayston’s rolls shot in Normandy caught my attention a year ago. I told Dale of my suspicions, but I thought little of it since I had not yet put it together with the other pieces of this puzzle. There were hours upon hours of other footage to be identified that took up the following months. 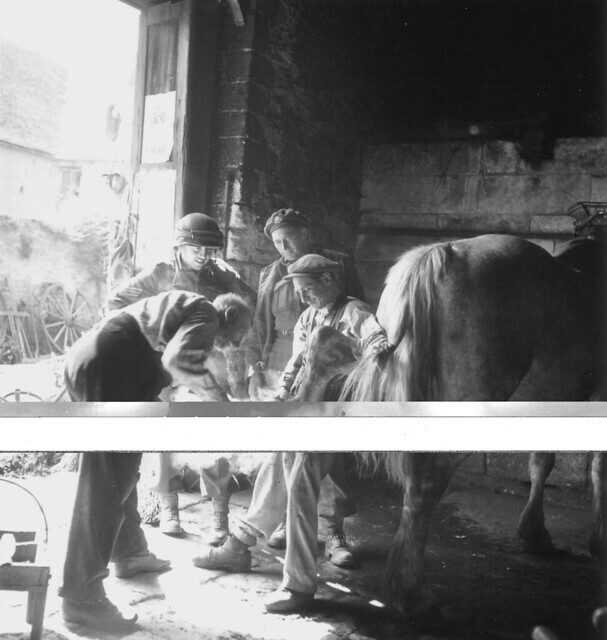 These two photos have been identified by Michel Le Querrec as the smithy of M. Le Le Jolivet on rue de Bayeux in Creully. 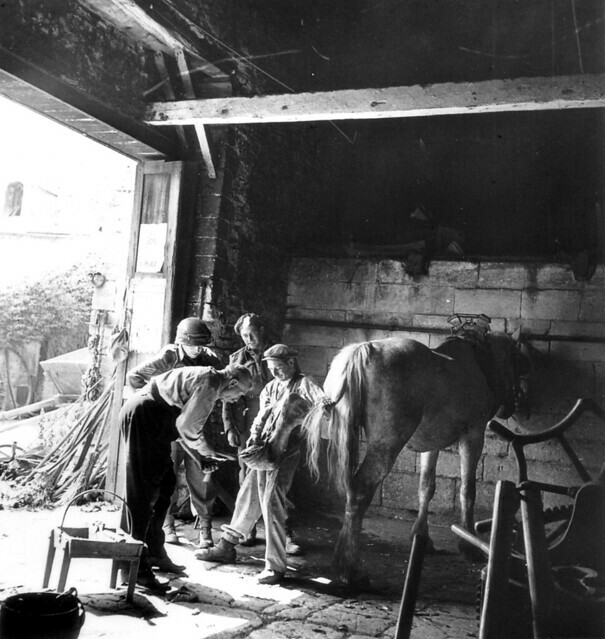 It is M. Le Le Jolivet himself shoeing the horse. Frederick Jeanne, author of “Hold the Oak Line” (2014) concurs. Above: the man in the US M1 helmet is obviously Al Grayston. The other Canadian looks like Lew Currie. Note the posters on the door and compare to the film footage. The smithy is the same building seen in the clip //www.youtube.com/watch?v=Vnbf-y-X_qI&feature=youtu.be&t=88. I’m certain that the source footage is from the US National Archives and that this is taken from a VHS. Look to the company “HD Archives” to do a new scan. In the near future we look forward to a 4K scan of this film that should make the identification a certainty, but this is as good as it gets with the material available today. It is our sincere hope that by giving these flickering images of those who died their names back we can better remember them. The discovery of this short clip comes from the voluntary work dome by many people around the world. Firstly we should thank the D-Day Overlord non-profit organization who made digital copies of this film held in the US National Archive available on line. This and other digital copies of these films are mostly from VHS copies made some time ago, and lack the definition of newer 4K scans, but many of these are the only publicly available versions of these films. This small clip of Currie comes to us through this organization. Most importantly are Michel Le Querrec and Patrick Peccatte of PhotosNormandie who make their discoveries available on Flickr. Many of these images are taken from prints made during the war by military public relations for the use of the world’s press. These photos have often lost the information about what is represented in them and M. Le Querrec in particular has done an exceptional job in identifying the date, location, and the people represented in these photos. We should also recognize author Frederick Jeanne, who’s extensive knowledge of the Canadian battlefields in Normandy and his willingness to discuss the images has helped us put the clues together. As Film and Photo Units filmed the events of the war, they also made photographs of the same events. These photos then become the key source of clues to identifying the fragments of footage shot by the Canadian Army Film Unit. It is extremely rare to find any true information about the film footage in records today, while information about the photographs has often survived in one or another collection. Even then, careful cross-referencing of sources is needed to confirm the information. Researching photographs has become the primary means of correctly identifying the orphaned footage of and by Canadians.